Vitamin D deficiency is linked to increased chances of developing cardiovascular disease, cancer, respiratory disorders, bone density problems and increased chance of premature death. When you read about the many vitamin D benefits be cautious, not all vitamin D is made equal. Research has clearly found that Vitamin D3 is far more effective and beneficial than its relative Vitamin D2. 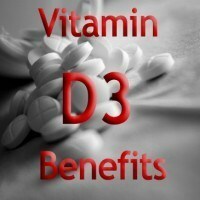 So we are looking at the Vitamin D3 benefits, of which there are many! Three of every Four Americans is deficient in Vitamin D. An alarming statistic that sheds some light on this epidemic. As we age our ability to synthesize and maintain Vitamin D levels lessens. This leaves us vulnerable to developing many bone related problems, joint pain and even cognitive impairment. Vitamin D improves our ability to process proteins, this improves hair quality and growth, nail skin and tooth health is also impacted positively. Calcitriol is an active form of D3 in our system, responsible for many important functions, one of which is maintaining bone health. Vitamin D deficiency is linked very closely to overall bone health and density. This is because Vitamin D3 is integral in the absorption and distribution of Calcium throughout the body. Improper levels of D3 and Vitamin K2 will lead to dangerous Calcium Deposits in our tissue, calcifying and causing serious health problems. Not to mention the fact that the calcium is not being absorbed and distributed among our skeletal structure and instead wreaks havoc in our tissues. Vitamin D3 is integral for optimal bone health. Maintaining levels of D3 in your system will ensure the prevention of bone disorders such as Osteoporosis and Arthritis. Cholecalciferol is the unhydroxylated form of Vitamin D3, it is a steroidal compound that can act as an immunosuppressant. This makes Vitamin D3 very useful in the treatment and prevention of Allergies and Autoimmune Diseases. 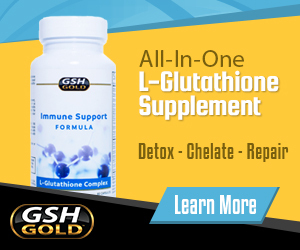 Alleviating symptoms of Asthma, Rheumatoid Arthritis, Multiple Sclerosis and many other immune response disorders. On a molecular level, Vitamin D3 will stabilize genes that have become cancerous. These cancerous cells will otherwise fester and damage neighboring cells, spreading the cancerous cells and causing an inflammatory response that furthers the damage. Low levels of Vitamin D3 have been directly linked to an increase in development of Colon Cancer, Breast Cancer, Prostate Cancer and Cervical Cancer. However any cancerous cell is impacted, proving it to be an effective supplement for any cancerous growth prevention. Calcium is essential for our hearts pumping function and Vitamin D3 is crucial for Calcium absorption. This makes Vitamin D3 absolutely essential for our heart health. Low levels of Vitamin D3 have been linked to the development of Arrhythmias, which can cause a heart attack and eventual death. Supplement Vitamin D3 levels to improve heart function, lowering blood pressure and minimizing the harmful effects stress has on your cardiovascular health. From improving energy levels to reducing your muscle recovery time and even reducing the pain associated with muscle repair. It may not be top of the list for supplements to improve athletic training and performance, but it certainly should be! This supplement has been used for ages in the professional sports and training world, yet it remains a mystery to most health conscious individuals. Low levels of Vitamin D3 cause a hastening in muscle fatigue and a poorer performance in muscular force. Want to curb your appetite and reduce those cravings? Vitamin D3 has been extremely effective in helping people lose weight naturally. Regulating serotonin in the brain, a chemical that is responsible for that feel good sensation you get when biting into that piece of chocolate or sipping a soft drink. A regulated serotonin level will ensure a much more modest response which will reduce cravings and improve overall mood. Aside from regulating our mood, Vitamin D3 is helpful in Calcium absorption. When your body lacks Calcium it drastically increases (up to 20x normal) the fatty acid synthase, an enzyme that converts calories in fat. Have your Vitamin D levels monitored by your doctor. A simple blood test called 25-hydroxy Vitamin D or 25-OH D can give you a much clearer picture of your health. 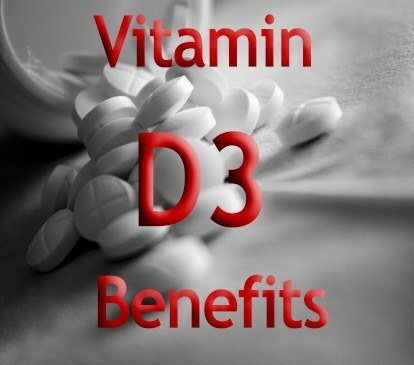 Supplement Vitamin D3 in addition to Vitamin K2 for healthy Calcium absorption. Insufficient levels of D3 and K2 when supplementing Calcium can not only be ineffective, but hazardous.